In august 2016, the Turkish Armed Forces (TSK) invaded Syria (announced by Transylvania Intelligence with hours before; predicted from August 2015) after the “Islamic State of Syria and Iraq” (ISIS) who had a direct border with Turkey, intensified shelling and terror attacks inside the country. The Turkish Prime-Minister called it “a right for Turkey’s self defense” in spite of Assad’s disapproval. Yet, ISIS wasn’t the only reason for the invasion. An equal important reason was the activity of the Kurdish groups, as the YPG/ YPJ, who are the military wing of the Patriotic Union Party (PYD) linked with the PKK. These military factions, YPG/YPJ, are the majority and the leading segment of the Syrian Democratic Forces (SDF) a multi-ethnic group that grew from the initiative launched by the Pentagon – the only successful US covert operation in Syria; in contrast to the failure of CIA’s train&equip program. This divergent and competing situations managed to weaken the decade long strategic partnership between the United States and the Turkey. The SDF, supported by the United States through aid, SOF (special operation forces) advisers and air cover, crossed the Euphrates to the west and liberated Manbij of ISIS. 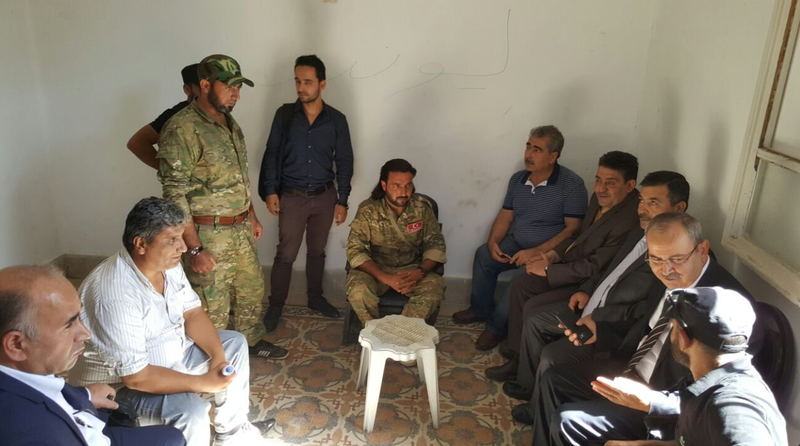 After establishing a SDF-friendly local council there, they announced intentions to liberate Jarabulus (sitting on the Turkish border) and Al-Bab – a strategic crossroad between Aleppo, border city of Al-Rai and Manbij. Here is when the Turks got triggered. An eventual liberation of this “pocket” area, controlled by ISIS, between Afrin (western Kurdish canton) and the eastern ones (beyond the Euphrates) would have linked all the Kurdish controlled territories; and in Ankara’s view, paved a way for a Kurdish political structure – autonomous or independent. Such a creation was already announced at that time, using even the Kurdish name for the region “Rojava” Federation. Turkish Armed Forces (in limited numbers), together with its traditional proxies – some Free Syrian Army groups, the Syrian Turkmen Brigades and (some-report) the Salafist Ahrar ash-Sham – crossed the border from Karkamis to its sister city over the border: Jarabulus (Cerabulus in Turkish). On August 24th the city was in Turkish hands. ISIS is known for using “in-depth tactics” – which means, they prefer to abandon assets/ controlled areas when faced with a massive force/assault, and make a tactical retreat to better guarded places. That is exactly what happened: they abandoned Jarabulus, leaving merely some suicide bombers, snipers and booby-traps behind while most of the jihadists retreated to Al-Bab – located 70-80 km south-west. Was al-Bab a better guarded city? Absolutely, in fact, the Turks and Rebels have managed to breach the city just on February 8th 2017, after a months-long siege and many failed offensives since October 2016. Since then the Turkish offensive has stagnated. But their other actions did not. Through Operation “Euphrates Shield” Turkey managed to secure a buffer zone, which ousted ISIS form its border and blocked the Kurdish militias, even the “umbrella” SDF group from uniting the cantons. Moreover, with this action, the Turks even managed to apply sufficient pressure on the Russian-Syrian authorities to involve them into the dealings. The buffer zone stretches 103 km on the Syrian-Turkish border (from Jarabulus to Azzaz), and carved 35 km deep into Syrian territory (Al-Bab outskirts). It encompasses a diverse religious and ethnic population with local political cvasi-structures and own military formations, as civil protection units (defensive purposes) or militias. Nonetheless, the demography works against the Kurdish militias. 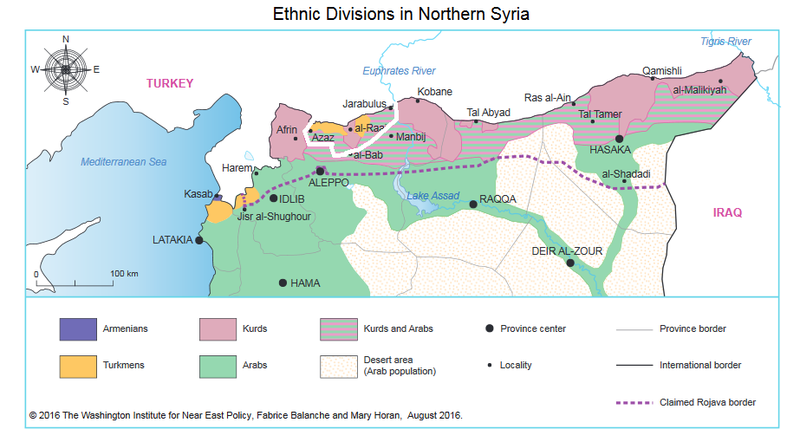 This pocket, from all the Kurdish claimed territories in northern Syria is the most dominated by Arabs. And most of the Arabic factions are supporting the Turkish operation, together with the lesser Turkmen ones. While the YPG-led SDF has the multi-ethnic advantage, covering a more diverse composition (Kurdish, Assyrian, Circassians, Christians, even some Arabs and Turkmens), the Turkish operation Euphrates Shield has the majority and the numbers. While the majority of Turkmens and Arabs support the uprising against the Regime, the Kurds, Christians or Assyrians do not, or stay neutral. Therefore Ankara began governing the liberated locations. I will present the example of Jarabulus, the first freed city and the longest under Turkish administration. Jarabulus/Cerabulus: A case of Turkish state-building? Under a strict ISIS control since 2014, the city was liberated on 24-25th August by the Euphrates Shield coalition. According to the 2004 census, the city had a population of 11,570 and it’s dimension being proportionally small. While Jarabulus (Cerabulus) is not a city difficult to administrate, the efforts put into it are mentionable. The first action accomplished by Ankara was to change the City Council affiliated with the Syrian Democratic Forces (SDF), operating in parallel, as a shadow administration even since the city was under ISIS control. The SDF have also accused the MiT (National Intelligence Organization/ Millî İstihbarat Teşkilatı in Turkish) of assassinating Abdulsettar Al-Cadiri, the commander of the Jarabulus Council, shortly before the Turkish invasion started. 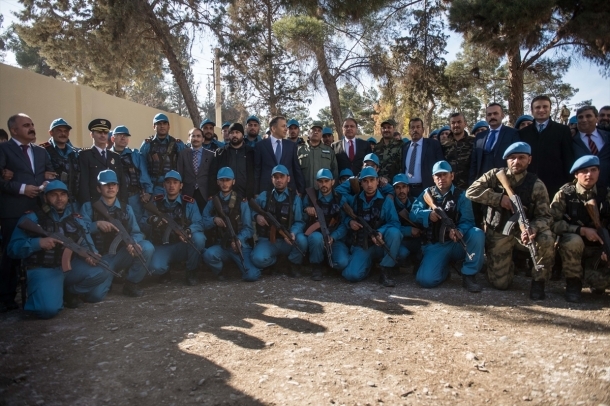 In September, the Jarabulus Military Council was filled with Syrian Turkmens loyal to Ankara. This move has fueled suspicions and accusations of bringing “separatists” to lead the town – a claim pushed by the divergent YPG-led SDF. Shortly, the Turkish Government began to get involved through its ministries in order to re-instate functionality into the city. In October 2016, The Energy ministry confirmed that work was under way on a 3km cable running from Karakamis in Turkey’s Gaziantep province to Jarabulus, Syria. It said a 2km stretch of the cable would be on Syrian territory and the rest in Turkey. This underground power cable supplies the Syrian town of Jarabulus. The electricity will be provided free of charge as part of the Turkish government’s humanitarian relief efforts. The plan also involved the provision of portable water to Jarabulus, supplied by the Gaziantep municipality. Turkey used to provide sections of northern Syria with electricity until late 2012 under a deal with Bashar al-Assad’s government in Damascus. In addition, many other health services are being done by Turkish municipalities to aid the Syrian population under Turkish liberation. That leaves us with security services and law enforcement. While in the given context many armed militias remain at loose, but in addition to the Military Council, which should project some kind of order and stability, Turkey has spearheaded initiatives to give the city a conventional public safety authority that will assume normal duties. In late January the first batch of 450 Syrian policemen trained in Turkey have been detached in Jarabulus under a new founded Police Force, commanded by General Abdel Razaq Aslan, a defector from the Syrian Arab Army (SAA/ Assad Regime). 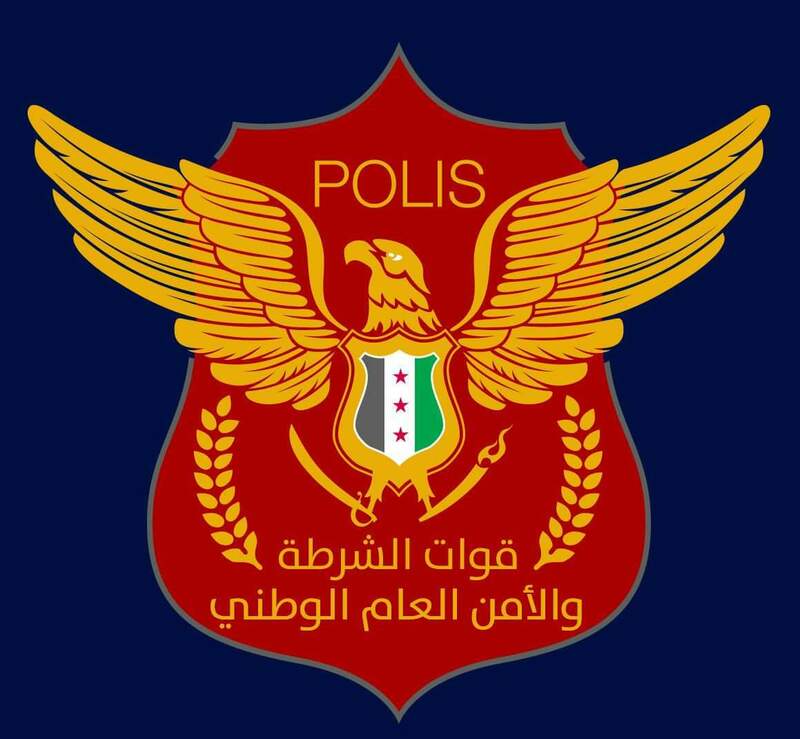 Some reports even indicate that Turkey has recruited refugees to train and detach in support of the Operation Euphrates Shield, including in the police force of Jarabulus; the information appeared on social media but has been corroborated by both Regime affiliated/ supporting news agencies, as Farsnews quoting the Jordanian al-Hadith and by dissident sources as Zaman al-Wasl. Sources from the camps of Islahiya1 and Islahiya 2, in Gaziantep city said Turkish government announced via the camps’ microphone that voluntary recruitment is open for young men aged between 20 and 35 years to join the security and police forces are intended to be founded in Syrian areas in Jarablus city which were recently liberated from the Islamic State by the military operation of Euphrates Shield. In a phone call with Zaman al-Wasl, General Aslan added that main task of security forces would be establishing stability and security to the area and eradicate the state of lawlessness in cities and towns have recently been liberated by the help of Turkish friends. Abdul-Razaq confirmed that forming security and police forces will be founded according to international regulations and law specified to police system. He revealed that training sessions have started already for 500 volunteers, with possibility to increase the number according to the need. 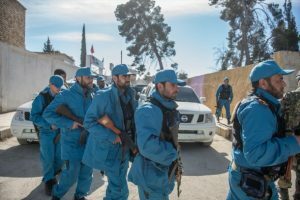 The supposed interview was given in December 2016, while the detachment of the first 450 policemen in Jarabulus was in January 24th 2017. The coincidental element could hold some truth to these reports. “Today is a very important day,” Ali Yerlikaya, governor of Turkey’s southeastern Gaziantep city, told at the inauguration ceremony. He said the new police force in Jarabulus has received a 5-week training at the request of the Free Syrian Army in the southern Turkish city of Mersin. The blue-colored uniformed policemen also received armored vehicles and technical equipment. Aleppo24 announced that Turkey has given an ultimatum to all Free Syrian Army forces to evacuate the city of Azaz in 15 days. Azaz, the most western city under the authority of Operation Euphrates Shiel will also benefit from a new Turkish-founded police force. An underestimated but important factor in drawing a conclusion of how life changed after the Turkish intervention, is through a look at the societal dynamics. 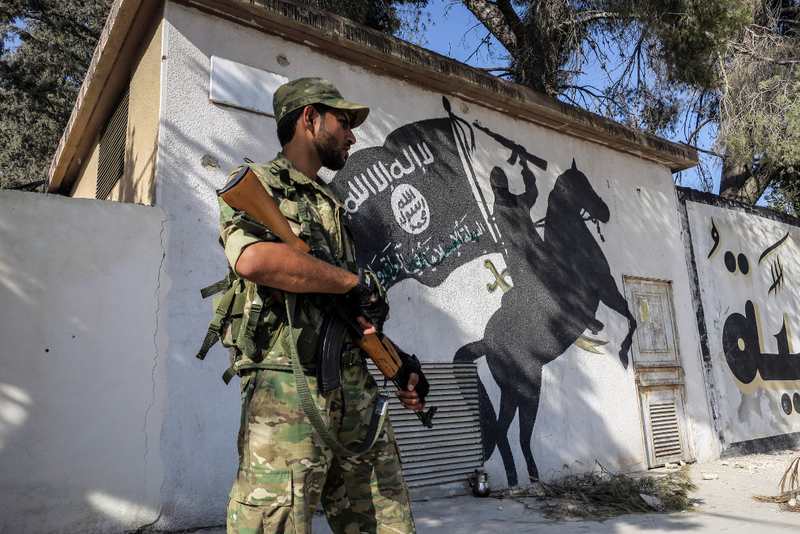 Whether we talk about the Idlib-based Islamic Front groups, the Kurdish-led SDF, Turkey or ISIS; every actor involved in Syrian Civil War has attempted to impose or engineered its own societal structure in regards with its agenda and ideology. So how does Turkey’s look? For one, the first signs of bureaucracy have appeared in town, with administration buildings and procedures. Flags of Turkey, Turkmen (blue with white crescent) or of Free Syria (Green-White-Black with three red stars) have been raised all over and in some cases, even pictures of Turkish President Recep Tayyip Erdogan. All of the re-opened schools in Jarabulus have these flags at its doorways. Some may say that this is an attempt of inserting Cultural Diplomacy and Turkism. Many NGO’s opened charity centers built in the style of a regular shop, where citizens can choose the food and clothing they want for free. The center will also mediate the more operational and coordinated implementation of aid sent to Jarabulus. Life goes on under the guard of policemen in blue uniform that patrol the streets. However an interesting dynamic occurred when the Turkish backed Jarabulus Council decreed this week that female school teachers were forbidden from wearing niqabs, burkhas or hijabs and male teachers forbidden from wearing Arab-style head dresses for “security reasons”. The next days, dozen men took to the streets to protest the law which they considered of being against “Islamic virtues” (video of protests here). Shortly after, the legislative initiative was dropped. Especially after the Islamist faction, Ahrar ash-Sham issued a statement pressuring the Council to retract the law and dismiss the initiators of it. The city is mainly under military protection of the Syrian Turkmen Brigades (Suriye Türkmen Tugayları) which are also Ankara’s most trusted proxy and a strategic asset Transylvania Intelligence identified from 2015, before the groups were trained and organized under a common banner. The umbrella organization encompasses Sultan Murad Divison, Sultan Mehmet, Sultan Suleiman and several others group. This is a living proof and an actionable way to capitalize the Ottoman era heritage to the so-called “Neo-Ottoman” foreign policy. While the Turkmen and the Policemen could have protected Jarabulus in case of an attack from Ahrar ash-Sham in regards to the burkha ban, Ankara probably considered that the reward it’s not worth the risk. While this episode was swift, it was also the kind of factionalism and ideological divergences that always prevented Turkey and the United States from forming a large scale, conventional opposition force. Maintaining an enclave of stability in cvasi-country like, under these circumstances will always be the greatest challenge for Turkey. There is no doubt that the Turkish invasion in Syria had an unprecedented breakthrough on the societal level. 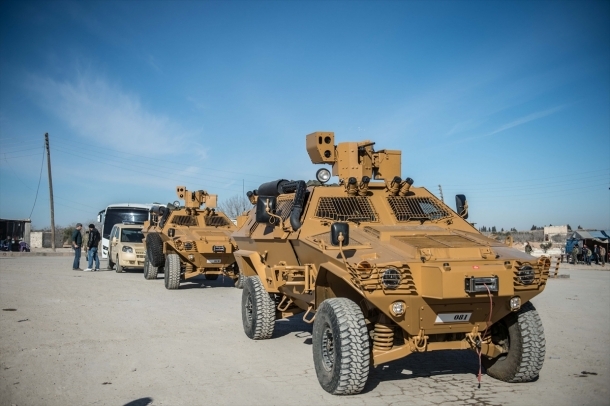 After the many tanks, armored vehicles of the Turkish Armed Forces passed through, facilities and constructions shortly followed. Public administration got re-established, critical infrastructure was built or repaired, basic health services was introduced while schools were re-opened. Moreover, it also brought entire communities back to life and thousands of refugees back to their homeland. Just in October, 24,000 refugees returned to Jarabulus. Last but no least, by reviving law enforcement institutions order was restored. And that’s something as rare it gets in the lawless, anarchic or autocratic Syria. However implementing such initiatives requires major investments and political willingness, but if applied earlier, it could have saved thousands of lives and at would have at least scaled down the refugee crisis that hit Europe. Another effect could have been the tempering of the cross-border oil trade and foreign fighter migration into Syria to join SIS and other Salafist groups. (1) It seems that Ankara has de facto attributed the liberated and captured territory from northern Aleppo Governorate, Syria under the Gaziantep’s Province authority of Turkey, engaging in a pragmatic overhaul. Moreover the embodiment of Turkish nationalism and Ottoman might in northern Aleppo Governorate, through cultural, economical and political efforts do seems that Ankara is looking to reign the territory on a long-term. Whether this means Annexation, directly as was the case of Alexandretta (now, Hatay) in 1939 or indirectly/ under influence, as the example of Northern Cyprus, it remains to be seen. Several differences strike contrast with the mentioned possibilities and examples: both Alexandreta (Hatay) and Northern Cyprus had at that time, and still have a Turkish majority population, whereas northern Aleppo has merely a small minority of Turkmen (not the same with Turkish) between Kurds and Arabs. And while the later where loyal and quasi-effective proxies, tensions did ultimately appear – as examples above show. 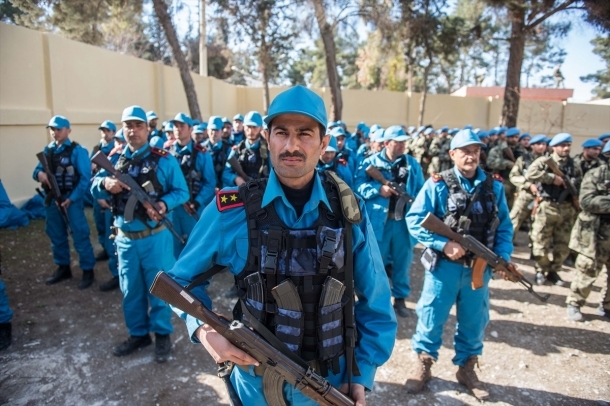 Furthermore, the perpetual usage in leadership positions of individuals of Turkmen ethnicity and tribal background, part of the Syrian Turkmen Brigades or Turkmen National Assembly, could fuel ethnic tensions on the long run with their Arab counter-parts – weary of neo-Ottoman efforts. Inherently exposing any long term Turkish stay to a systemic hostility from the wider local population and the strong Islamist militias. Thereby, an annexation of any type will prove problematically for practical reasons and would actually fuel the factionalism and inter-ethnic tensions in the region. However the Syrian Civil War is an unprecedented conflict, where dramatic decisions have been taken and radical measures are needed, inherently we cannot rule out this possibility. Although more observations are needed to fully conclude this hypothesis – which means that Ankara needs to implement the same administrative efforts in more cities in order identify whether there is a common pattern or a different, tailored approach. (2) Subsequently, contrary to the Turkish Government’s recent change of tone in regards to Assad, Ankara would still likely pursue an overthrow/ state-building policy – one way or another. The flexibility shown lately simply accepted to include Assad in an eventual transitional dialogue, but not in keeping him in power. The speech was accommodated in order to engage in diplomacy (behind close doors and public) with the Assad regime in Damascus and its backers: Russia and Iran. While the later had few leverage or capabilities to fight or take an aggressive stance against the Turkish presence in the north, all of them knew that with every second that territory is under Turkish and FSA control, the rebels are gaining more power. 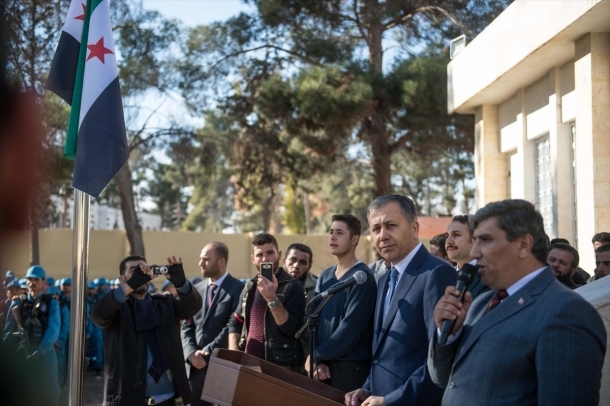 In addition, both the Syrian Interim Government, based in Gaziantep and its creator, the only legitimate dissident political structure, named the Syrian National Coalition of Syrian Revolutionaries and the Opposition Forces, still exist. I assess that plans for a regime change are still on the table and are being unofficially debated through the Astana talks format, together with Russia. The way Turkey has been engaging in the state-building process in the liberated areas, only paves the way for a new regime, a new authority. (3) As an official annexation seems dramatic and an Opposition take-over is currently unlikely as ever, the Turkish national security interest still has a downsized and less hostile option on the table: a limited Safe Zone. I assess that the Turkish interest in Syria could be also be satisfied by adverting social and economical burdens of hosting 2-3 million refugees and of denying free movement of ISIS fighters over the border or Kurdish militias activity and self-determination near Turkey. A safe zone, guarded by ground and air assets, as highlighted many times on this platform, would satisfy all those needs. However its strategic value is limited. While it would over a staging point for dissidents, if the Assad regime in Damascus would regain control and reinvigorate its military, a safe-zone administrated by Turkey would be perceived as a sovereignty violation, thus opening the door to the “good old” Turkish-Syrian tensions, through subversive maneuvers or not – it really depends on what kind of a convergence would the bilateral efforts produce in regards to the Kurdish question. Accordingly to President Erdogan’s announcement on February 12th 2017, the end-goal of Turkey’s operation in Syria is Raqqa; and subsequently to establish a 5,000-square km safe zone. In addition, a concrete wall is being built to stop illegal crossings along the length of Turkey’s 900-km (560-mile) border with Syria. Whether these measures will be sufficient to stop cross-border migration, hostile movements and limit national security threats, it remains to be seen. But Ankara has long been under pressure from its NATO allies to seal off the border. At the moment the Turkish Armed Forces and its allies are storming the city of Al-Bab, the conclusion of that critical battle will likely influence their further strategic agenda beyond border enforcement. Thereby a definitive outlook will be better reflected through months, maybe years of extended state-building from Turkey’s part in northern Syria; but purely assessing the case of Jarabulus we can concluded that Ankara is the only actor that looked in perspective and left something constructively behind. „SDF-led Jarabulus council announces ceasefire with Turkey-backed rebels”, ARA News, http://aranews.net/2016/08/sdf-led-jarabulus-council-announces-ceasefire-turkey-backed-rebels/, data accesării 13 februarie 2017. „Kurds accuse Turkish intelligence of assassinating military leader in Syria’s Jarabulus”, ARA News, http://aranews.net/2016/08/kurds-accuse-turkish-intelligence-assassinating-military-leader-syrias-jarabulus/, data accesării 13 februarie 2017. Antonopoulos, Paul, „Free Syria Army withdraws from Jarablus bases, cites disagreements with separatists”, AMN – Al-Masdar News | المصدر نيوز, https://www.almasdarnews.com/article/free-syria-army-withdraws-jarablus-bases-cites-disagreements-separatists/, data accesării 13 februarie 2017. „Turkey sends power lines into Syrian town cleared of IS”, Middle East Eye, http://www.middleeasteye.net/news/turkey-sends-power-lines-syrian-town-cleared-21416447, data accesării 13 februarie 2017. „Cerablus’ta atıl okul binası hastaneye dönüştürüldü”, Anadolu Ajansı, http://aa.com.tr/tr/dunya/cerablusta-atil-okul-binasi-hastaneye-donusturuldu/652979, data accesării 13 februarie 2017. „Turkish «angel» paramedic on errand of mercy in Jarabulus – Anadolu Agency”, http://aa.com.tr/en/vg/video-gallery/turkish-angel-paramedic-on-errand-of-mercy-in-jarabulus—/17, data accesării 13 februarie 2017. „Turkish police guard the streets of Syria’s Jarabulus – Anadolu Agency”, http://aa.com.tr/en/vg/video-gallery/turkish-police-guard-the-streets-of-syrias-jarabulus/0, data accesării 13 februarie 2017. „450 Members Of Turkish-Trained «Syrian Police» Deploy To Jarabulus”, https://southfront.org/450-members-of-turkish-trained-syrian-police-deploy-to-jarabulus/, data accesării 13 februarie 2017. „Farsnews”, http://en.farsnews.com/newstext.aspx?nn=13951009000780, data accesării 13 februarie 2017. „Turkey to recruit young refugees in areas taken from ISIS SYRIA NEWS |”, SYRIA NEWS | ZAMAN ALWSL, https://en.zamanalwsl.net/news/21642.html, data accesării 13 februarie 2017. Şafak, Yeni, „Police deployed in Syria’s Jarabulus after liberation”, Yeni Şafak, http://www.yenisafak.com/en/world/police-deployed-in-syrias-jarabulus-after-liberation-2602278, data accesării 13 februarie 2017. Acar, Cemal, „Cerablus polis gücüne kavuştu”, EJDER HABER AJANSI, http://ejderhaberajansi.com/cerablus-polis-gucune-kavustu.html, data accesării 13 februarie 2017. 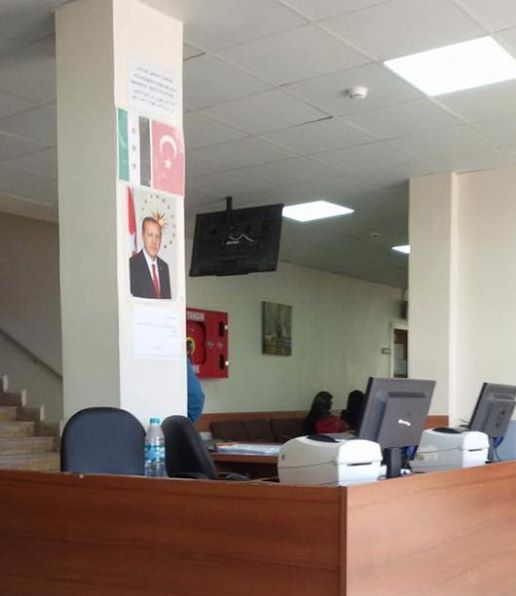 Şafak, Yeni, „Charity center opens in Jarabulus, Syria”, Yeni Şafak, http://www.yenisafak.com/en/world/charity-center-opens-in-jarabulus-syria-2598729, data accesării 13 februarie 2017. Arab, The New, „Burka ban in town recaptured from IS sparks anger”, alaraby, https://www.alaraby.co.uk/english/news/2017/2/13/burka-ban-in-town-recaptured-from-is-sparks-anger, data accesării 13 februarie 2017. جرابلس, إعلام مدينة, „بيان من المحكمة المركزية في مدينة جرابلس وآخر من حركة أحرار الشام الاسلامية ضد القرار الذي اصدره المجلس المحلي بمنع النقاب داخل المدارس.pic.twitter.com/ABFwDUrFfT”, @jraplos, https://twitter.com/jraplos/status/830541914671874048, data accesării 13 februarie 2017. Şafak, Yeni, „Some 24,000 Syrians back home in Jarabulus from Turkey”, Yeni Şafak, http://www.yenisafak.com/en/world/some-24000-syrians-back-home-in-jarabulus-from-turkey-2595760, data accesării 13 februarie 2017. „Erdogan says safe zones must be created in liberated Syrian regions”, TASS, http://tass.com/world/930615, data accesării 13 februarie 2017.